From time to time one of these puzzles pops up on my Facebook feed, and so I thought it would be fun to create a stitched version too. It’s really easy to spot the “odd one out” as the little panda is sporting a brightly coloured party hat complete with fluffy pompom, all ready for the party season ahead. This hoop is very simple to stitch and would make a great beginner’s project – its success depends upon the accuracy of your back stitching,which is all worked in a single strand of black floss. And now we’ve taken all the hard work out of tracing your design by putting together a kit that includes a pre-printed panda panel. 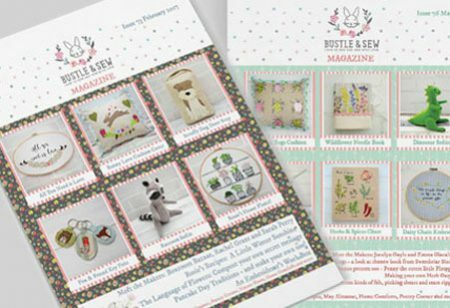 Inside your kit you’ll discover a nice quality cotton panel pre-printed with the design, all the floss you’ll need to complete your project, a needle, and full instructions for working the design, including stitch diagrams and photographs. It’s sized to fit an 8″ hoop, but this is the one item we don’t include as to do so pushes up not only the cost of the kit but postage too. I have checked and 8″ hoops are readily available online across the world. Be sure to choose a nice quality one, even though they’re a little more expensive, cheap bamboo ones really aren’t very nice to work with.